Identification: Moyle (1976); Page and Burr (1991). Maximum size: 55 cm. Native Range: Sacramento--San Joaquin, Pajaro, and Salinas River drainages; Clear Lake, California (Page and Burr 1991). Table 1. States with nonindigenous occurrences, the earliest and latest observations in each state, and the tally and names of HUCs with observations†. Names and dates are hyperlinked to their relevant specimen records. The list of references for all nonindigenous occurrences of Orthodon microlepidotus are found here. Means of Introduction: The record from Truckee Valley pond is based on a single specimen and several hybrids taken in the late 1940s (La Rivers and Trelease 1952); it was first discovered in the Lahontan Reservoir area in 1962 (downstream of the dam) (La Rivers 1962). R. R. Miller tentatively suggested that Orthodon may have gained access to the Truckee Meadow pond through fish rescue material sent up from the Sacramento Valley (La Rivers and Trelease 1952; La Rivers 1962). The means introduction into other areas apparently is unknown (possibly unauthorized stockings by private individuals). According to Swift et al. (1993) this species was in Tweedy Lake, southern California in 1918 and subsequently spread into other Los Angeles County lakes. 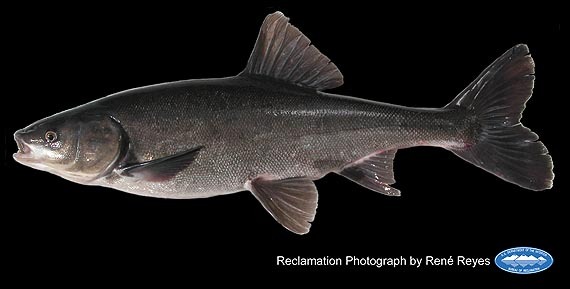 Status: This species was eradicated from Lake Hughes, and (apparently) other Los Angeles County lakes in the early 1940s; it has been established in the lower Santa Ana River, California, since about 1986 (Swift et al. 1993). According to information given by Moyle (1976), the species apparently is established in the Russian River; however the status of the Carmel River population is questionable. La Rivers (1962) stated that all cyprinids in the Truckee Meadow pond, Nevada, were "winterkilled" during 1948-1949 (the pond was subsequently drained). Even though it was suggested that the species may exist in drainage ditches east of Sparks, Nevada (La Rivers and Trelease 1952; La Rivers 1962); we are unaware of any reports verifying its occurrence in that area. Based on collections made in 1962, La Rivers (1962) concluded that the population was established in the area of the Lahontan Reservoir. Deacon and Williams (1984) also noted that it was established in Lahontan Reservoir. Impact of Introduction: According to Burns (1966), Sacramento Blackfish compete with young game fish for food and space. Specimens taken from the Truckee Meadow pond included hybrids, presumably between Orthodon and "Siphateles bicolor obesus" (La Rivers and Trelease 1952; La Rivers 1962) (the latter form now recognized as Gila bicolor obesa). Remarks: There is some uncertainty concerning the native versus nonindigenous status of this species in the Russian River of California. Moyle (1976) stated that Orthodon microlepidotus was "apparently introduced into the Russian River." Based on their distribution map, Lee et al. (1980 et seq.) apparently considered it to be native to the Russian River. Minckley et al. (1986) listed it as native to the Sacramento River drainage; they made no mention of introductions. In its native range, hybrids have been reported with Lavinia exilicauda (Swift et al. 1993). A commercial fishery exists in California for this species, centered around the Chinese-American food trade (Moyle 1976; McGinnis 1984). Burns, J.W. 1966. Sacramento blackfish. Pages 522-525 in A. Calhoun, (ed). Inland fisheries management. California Department of Fish and Game. Sacramento, California. La Rivers, I., and T.J. Trelease. 1952. An annotated checklist of the fishes of Nevada. California Fish and Game 38(1):113-123. Lee, D.S., C.R. Gilbert, C.H. Hocutt, R.E. Jenkins, D.E. McAllister, and J.R. Stauffer, Jr. 1980. Atlas of North American Freshwater Fishes. Volume 1980. North Carolina State Museum of Natural History, Raleigh. McGinnis, S.M. 1984. Freshwater fishes of California. University of California Press, Los Angeles. Moyle, P.B. 1976. Inland fishes of California. University of California Press Berkeley, CA. http://books.google.com/books?id=8ZCStnV581kC&printsec=frontcover&dq=fishes+of+california&hl=en&sa=X&ei=t0dOT-P-Nsna0QH88rS7Ag&ved=0CDUQ6AEwAA#v=onepage&q=fishes%20of%20california&f=false. Page, L.M. and B.M. Burr. 1991. A Field Guide to Freshwater Fishes - North America North of Mexico. Volume 42. Houghton Mifflin Company, Boston, MA. Vinyard, G.L. 2001. Fish Species Recorded from Nevada. http://www.brrc.unr.edu/data/animal/vertebrates/fishlist.htm.